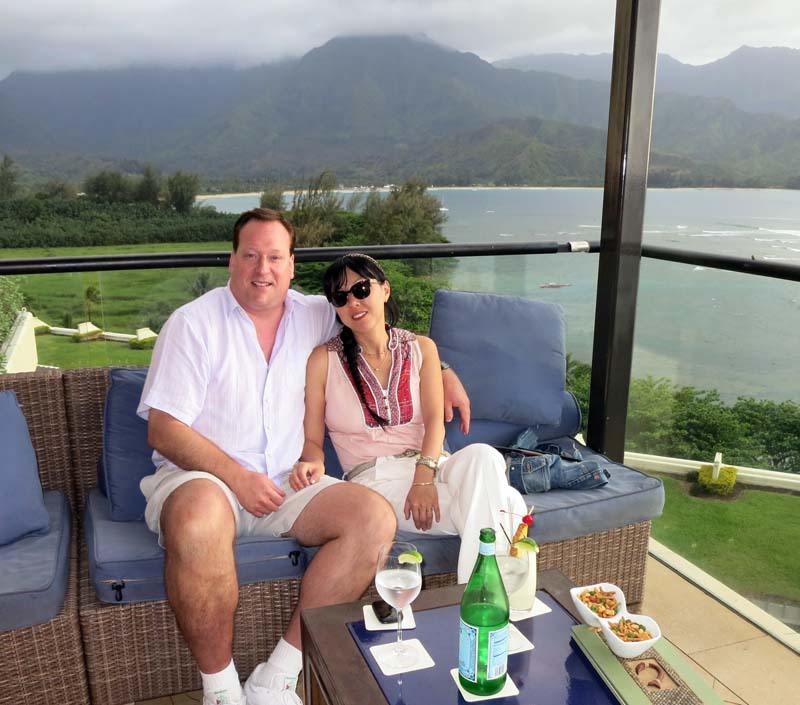 On 4/17/2014 Katherine and me (Brian) travelled to Hawaii. We met up with Will and Lia and also saw Teddy. 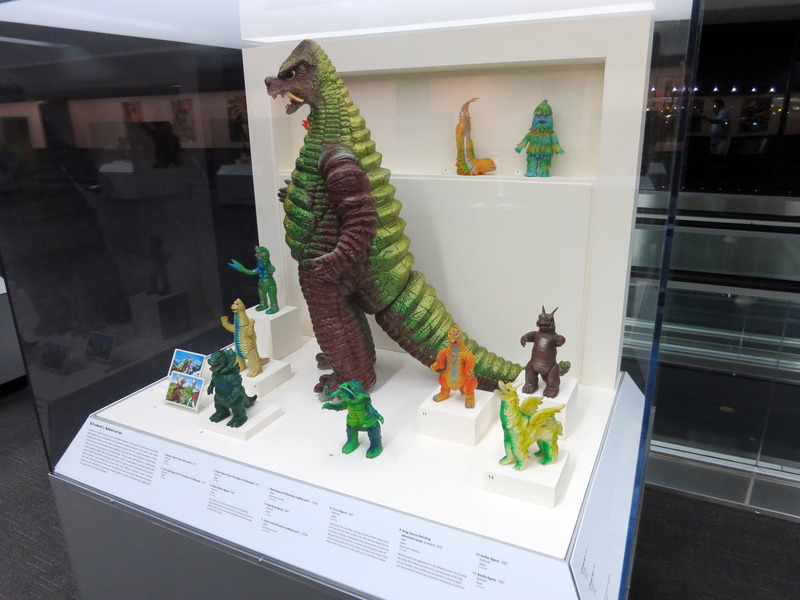 Here are some pictures, click on any of them to get a HUGE highest quality original. Also, click here for a map of interesting places in Kauai. 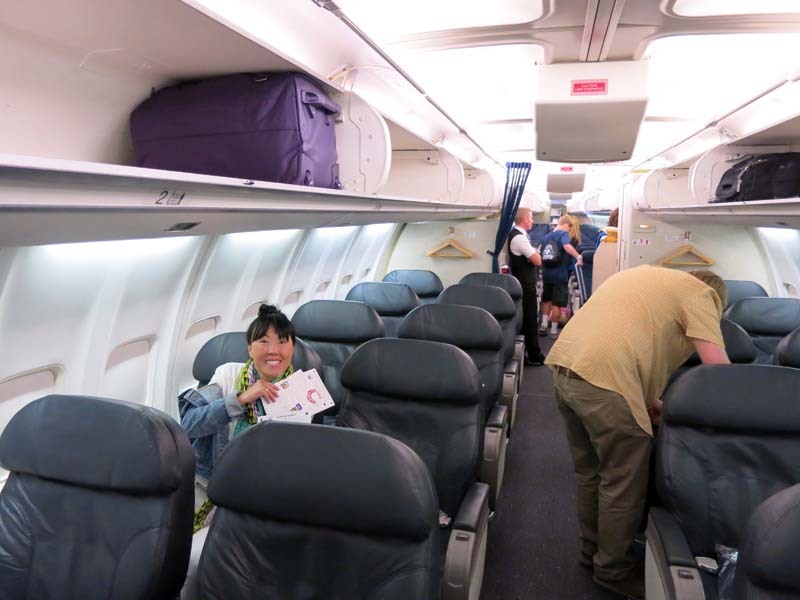 Below Katherine is excited to go to Kauai, we are just boarding the plane. 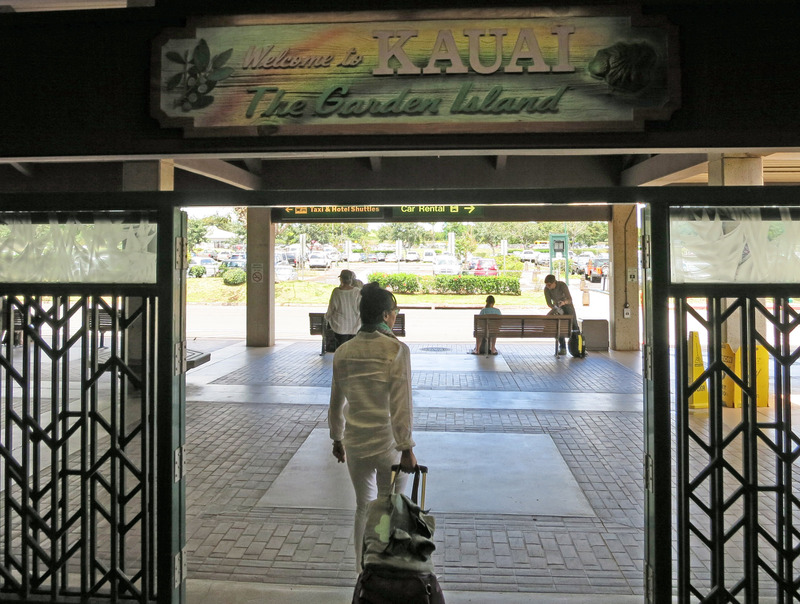 Arriving at the airport in Kauai. 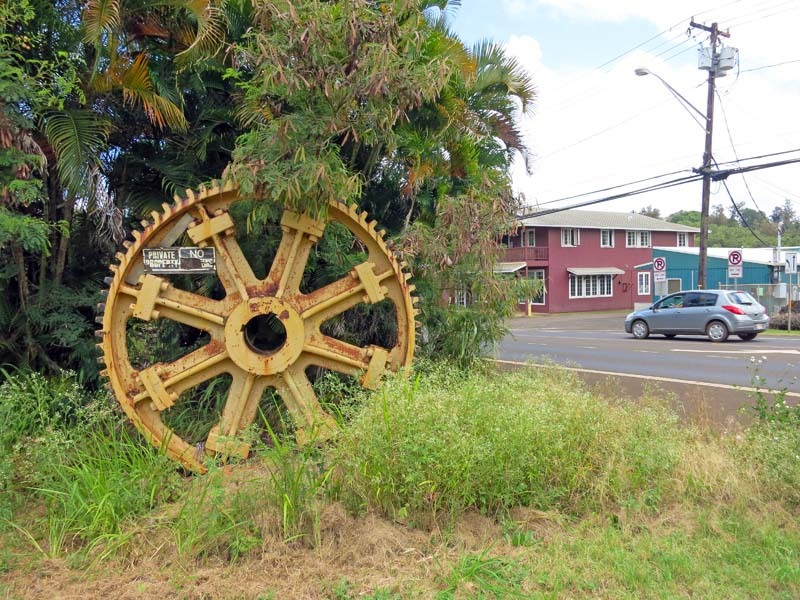 I thought this antique tractor wheel was really neat. 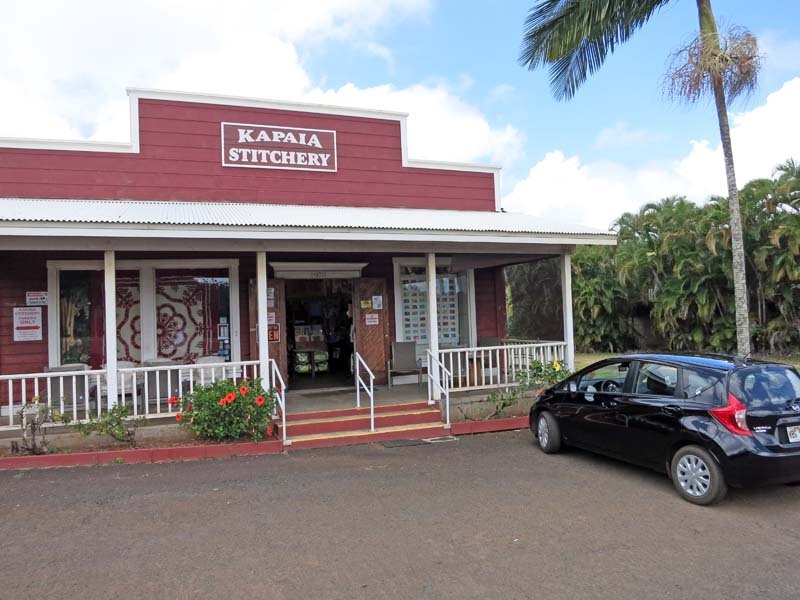 First stop, Kapaia Stitchery to get a quilt for Mercedes and Jamison. 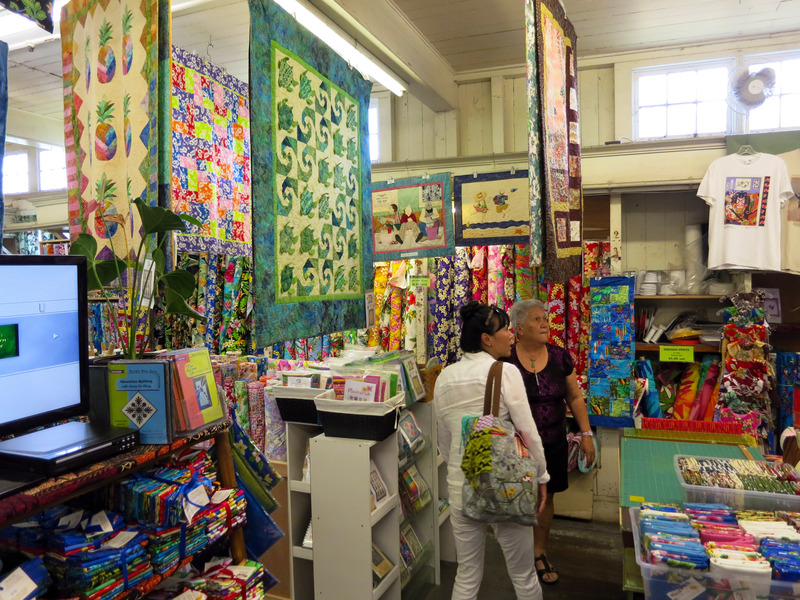 Inside the Kapaia stitchery, that's Katherine talking with the store keeper about various quilts and fabrics. 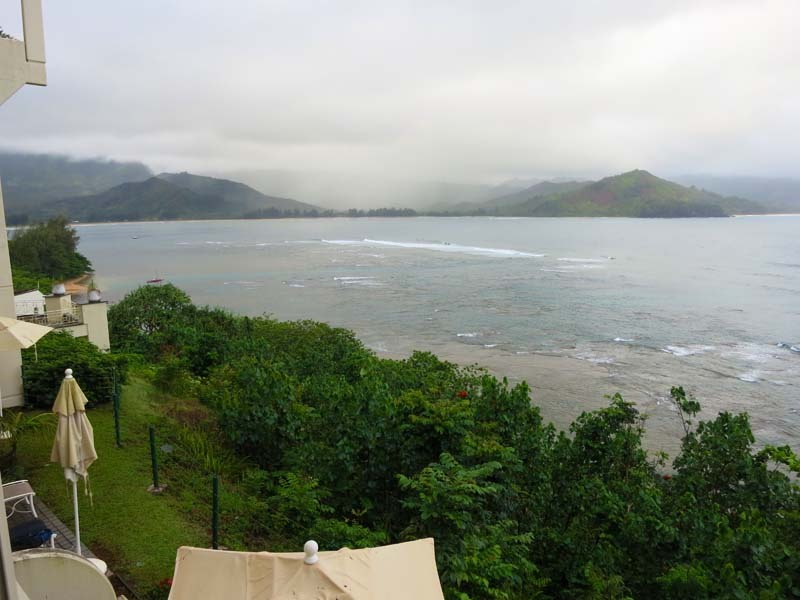 Next stop, we check into our hotel which is the St Regis Princeville in Kauai. As we walked around, we ran into Kendall MacDonald wakling into the elevator we were riding. 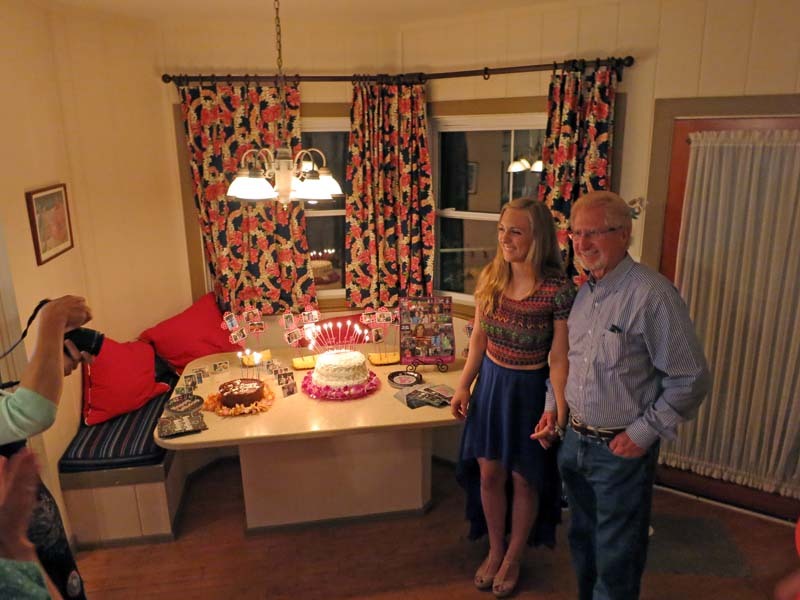 Kendall is the birthday girl (the excuse we needed to come to Kauai for a few days). 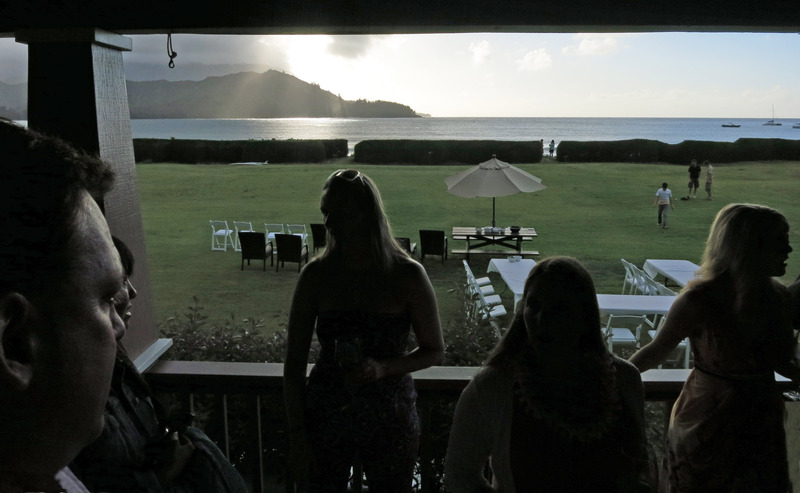 A few hours later near sunset on Thursday, we show up at the location of Kendall's party, which is The "Nalu Beach Cottage" at 5032 Weke Rd, Hanalei, Kauai, Hawaii. 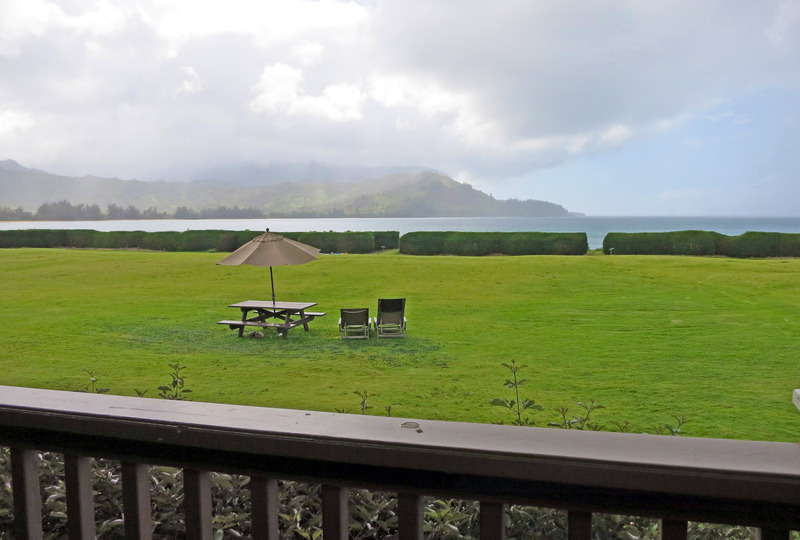 We're standing on the back deck below, looking out over a large green lawn, then a beach and Hanalei Bay. That's Katherine on the left, Lia MacDonald, and Nicky Greenshields on the right. 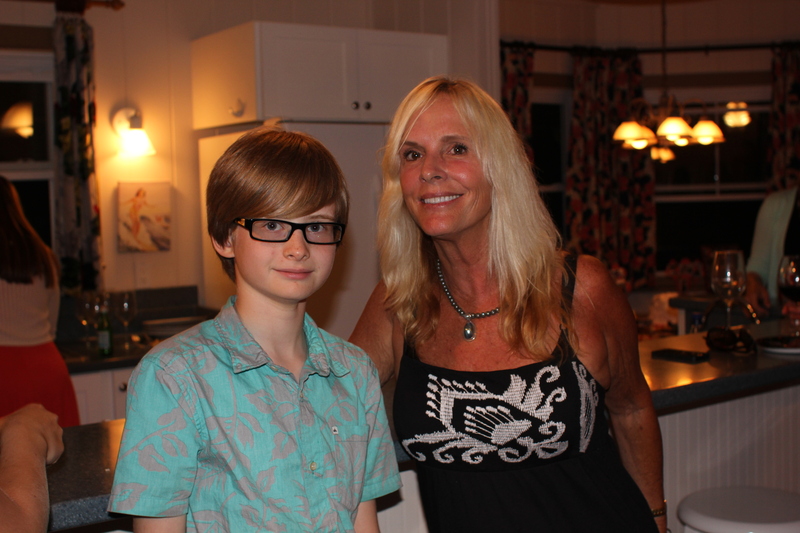 The picture below is Susan Blaylock standing with Bryn Greenshields. 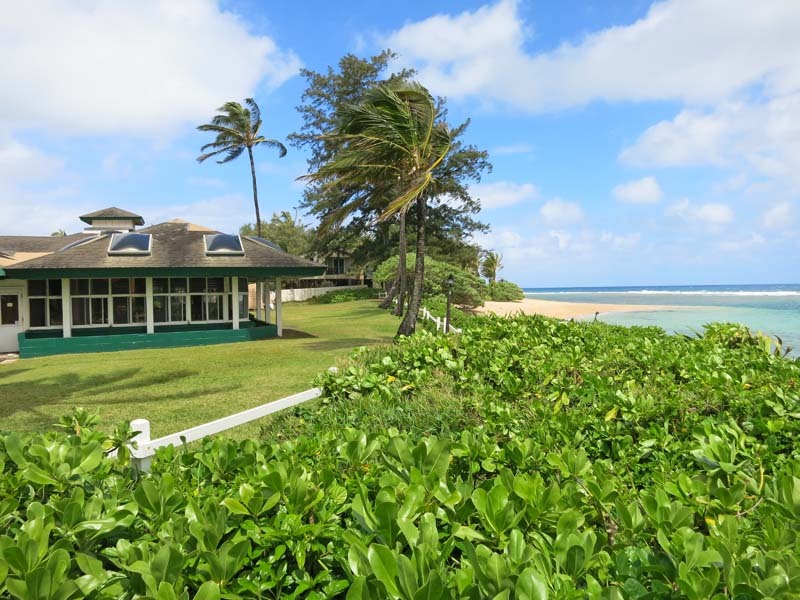 Susan is a real estate agent that sold Will and Lia a home in Kauai. 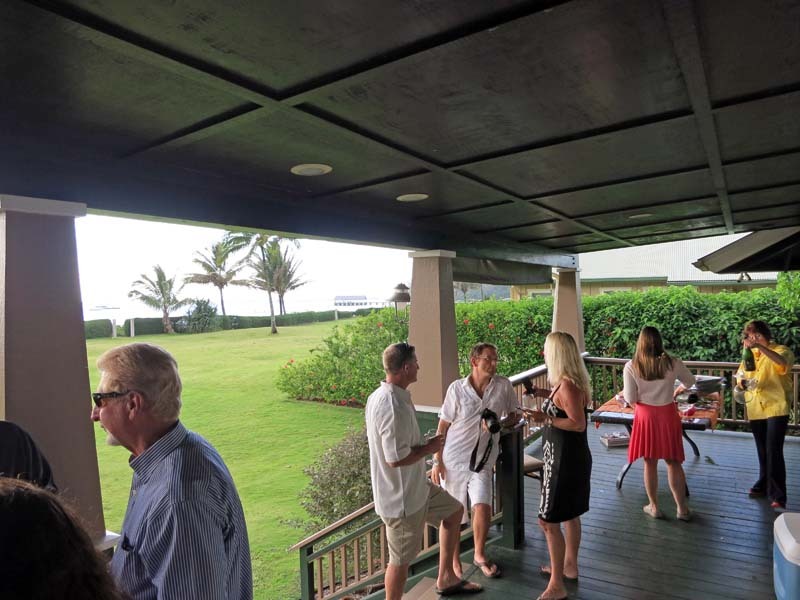 Another picture of the back deck, on the left is Art Boone who is Kendall's grandfather and ALSO having a birthday party. 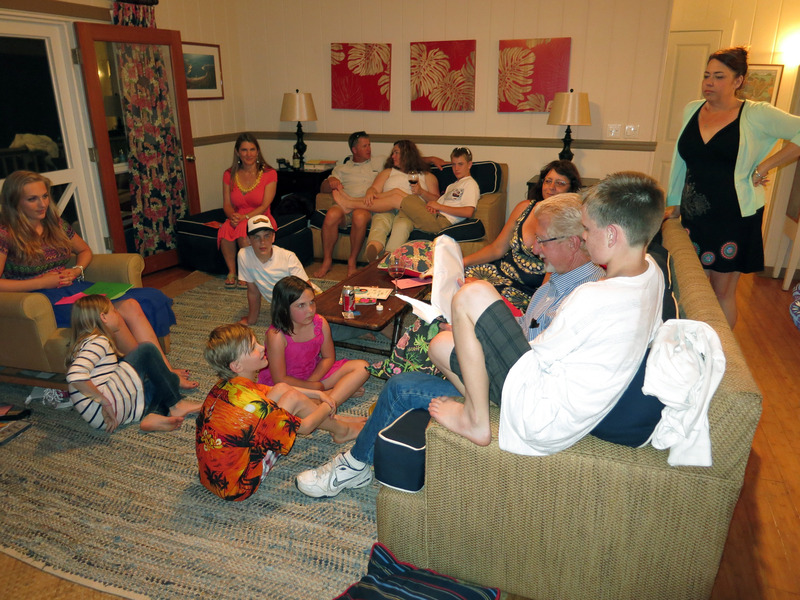 Lia's brother James Boone is talking with Will (holding the camera). 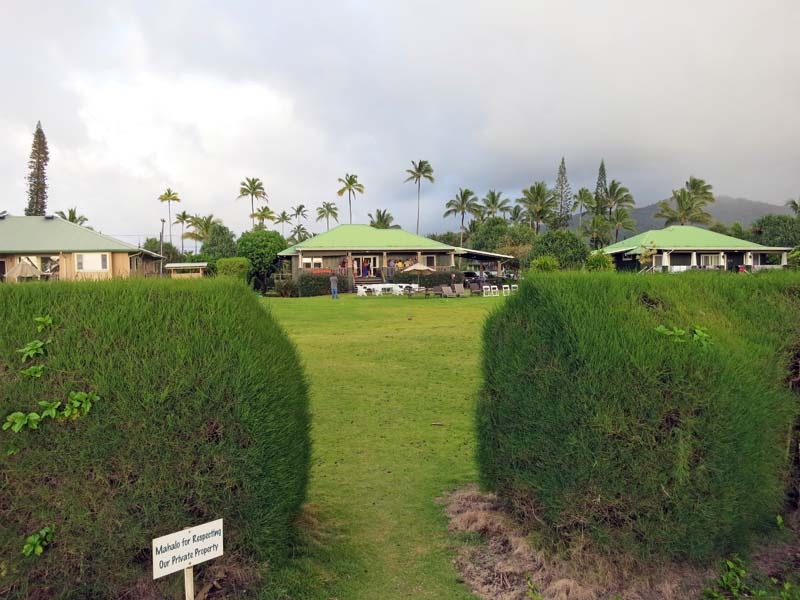 Standing on the green lawn with my back to the ocean looking at the house. 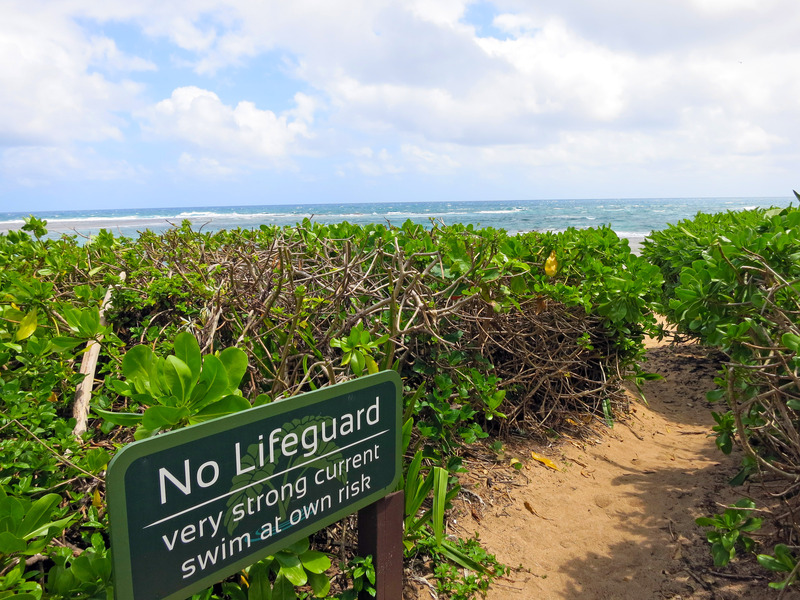 I'm standing on the public Hanalei Bay beach, and here is a sign saying "Mahalo for Respecting Our Private Property". 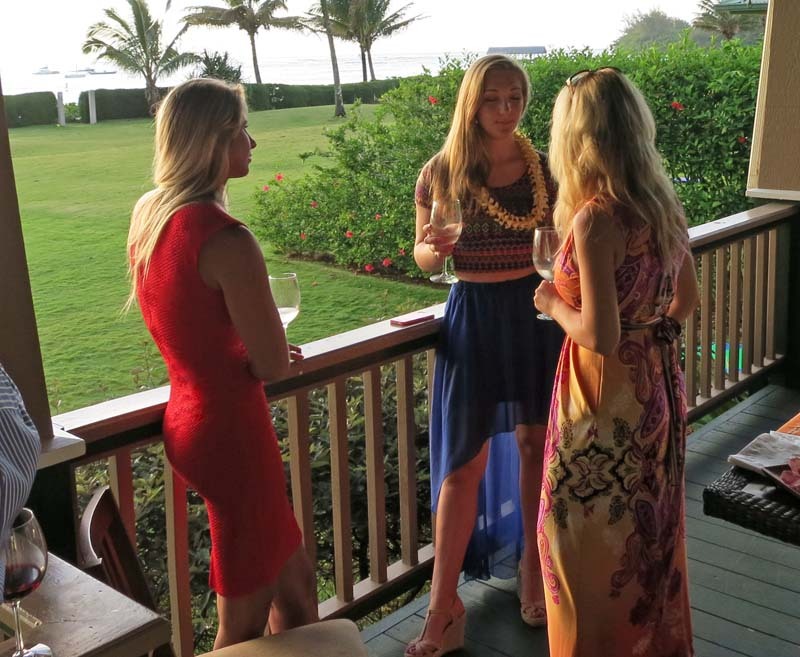 From left to right that is: Vicky Stratton (in red), Kendall MacDonald (birthday girl in blue skirt), and they are talking with Monika Mordasini (facing away). As the sun set, we were treated to Coppin Colburn singing traditional Hawaiian songs while his daughters danced hula. 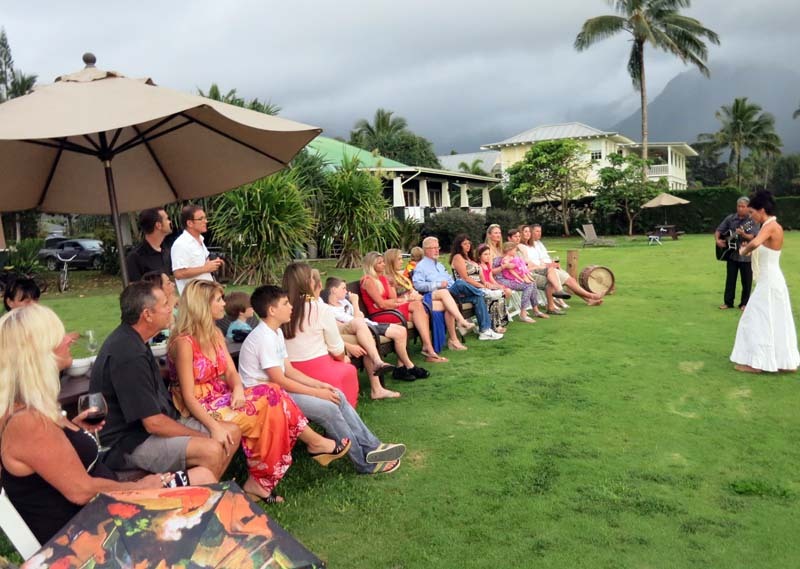 From left to right the front row is: Bob, Monika Mordasini, Lia (red dress), Lia's nephew in white T-shirt 1 (leaning over), another nephew, Vicky Stratton (red dress), Kendall MacDonald (birthday girl), Art Boone (birthday boy), Art's wife Patti, Catherine Boone, Fiona MacDonald, and finally Nicky Greenshields with Ione in her lap. 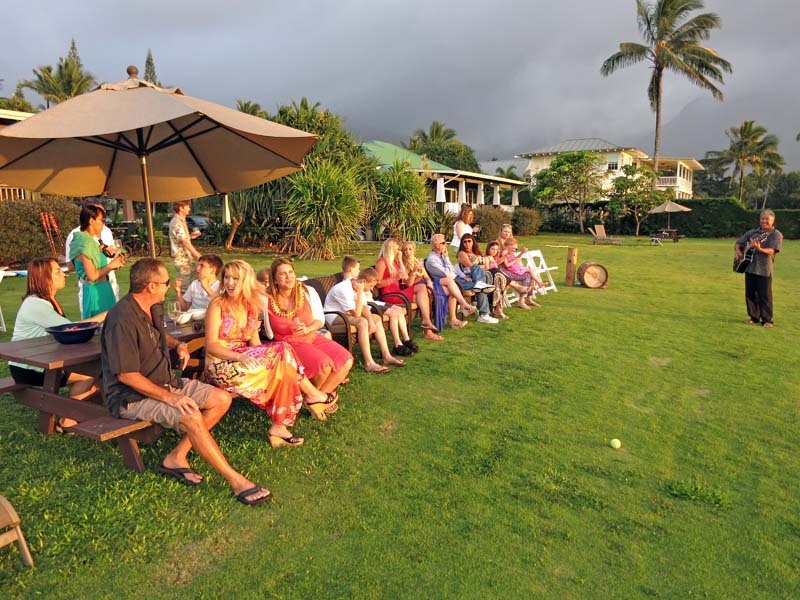 Behind the front row from left to right is: Jennifer McMenamy (sitting down at table), Katherine Chung (green dress), Will MacDonald (behind Katherine), Bob Greenshields in FAR back kind of blurry, Mitchell sitting at table with his hands up. 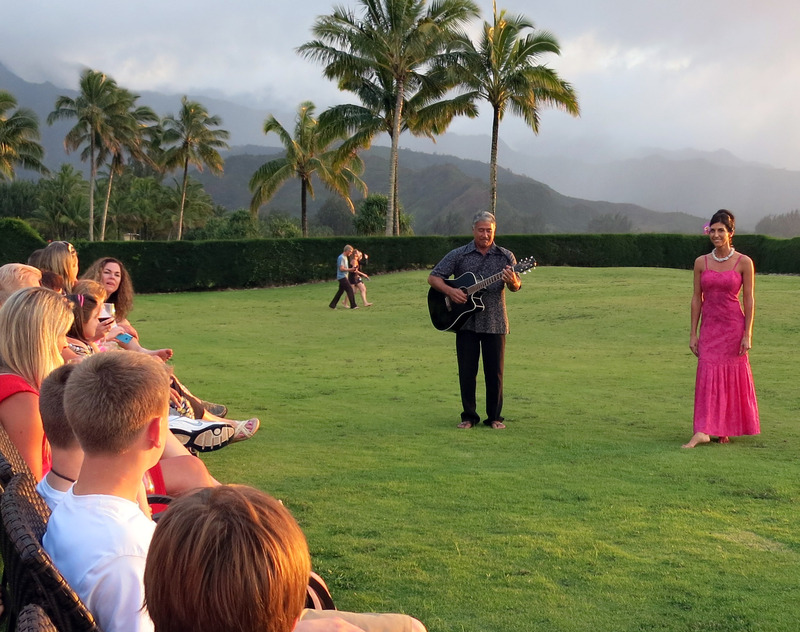 Coppin Colburn singing Hawaiian songs with a beautiful hula dancer on the beach in Hanalei Kauai. It was a nice performance, very fun. 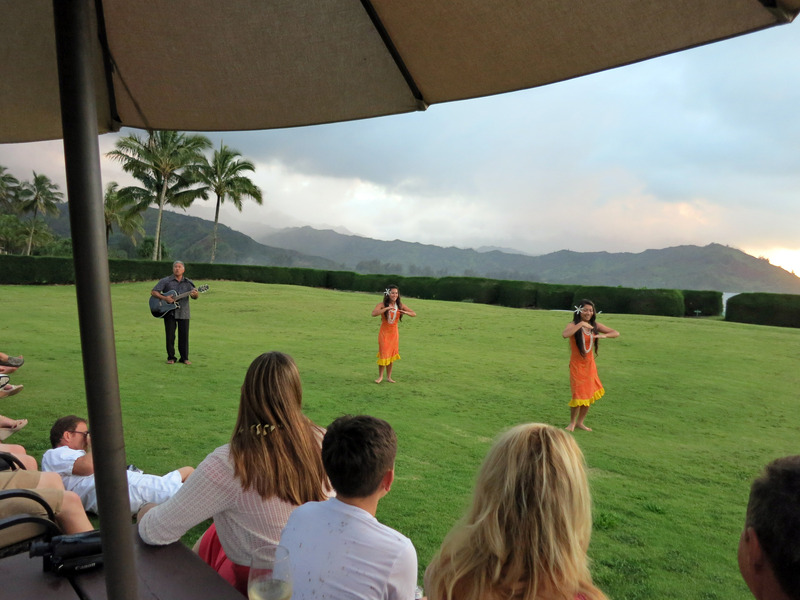 Coppin Colburn's daughters are seen below in orange dresses dancing hula. 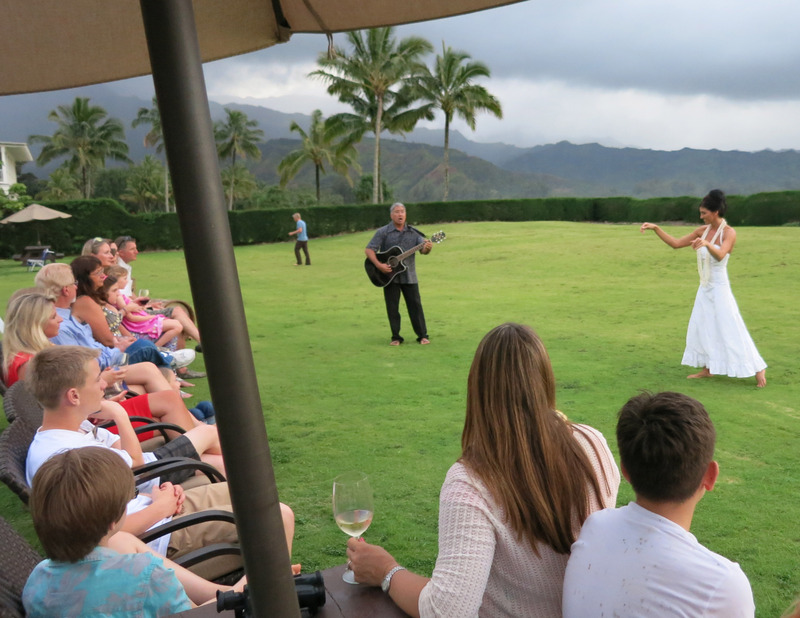 I think this is a performance of "Ke Kali Nei Au" which is the Hawaiian Wedding Song. The hula dancer is dressed in a white wedding dress. Will MacDonald with his camera. 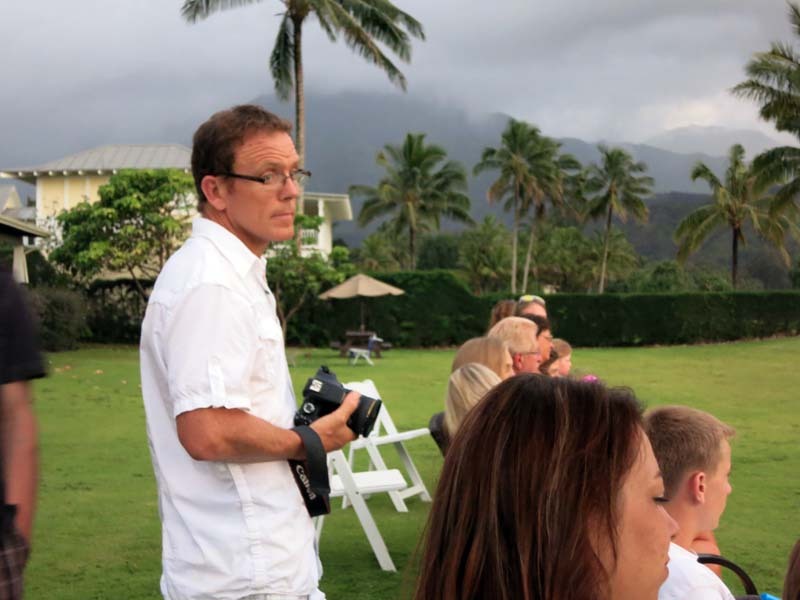 Will is the father of Kendall (the birthday girl). 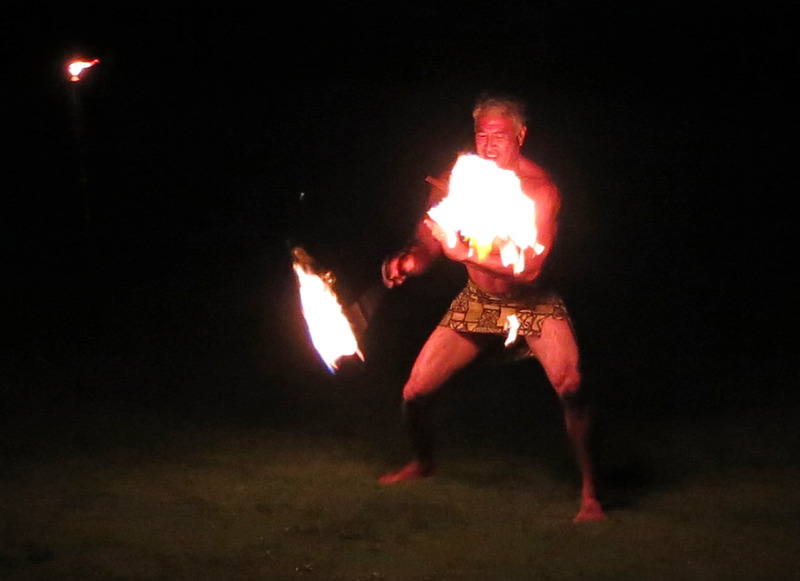 More pictures of the performance. 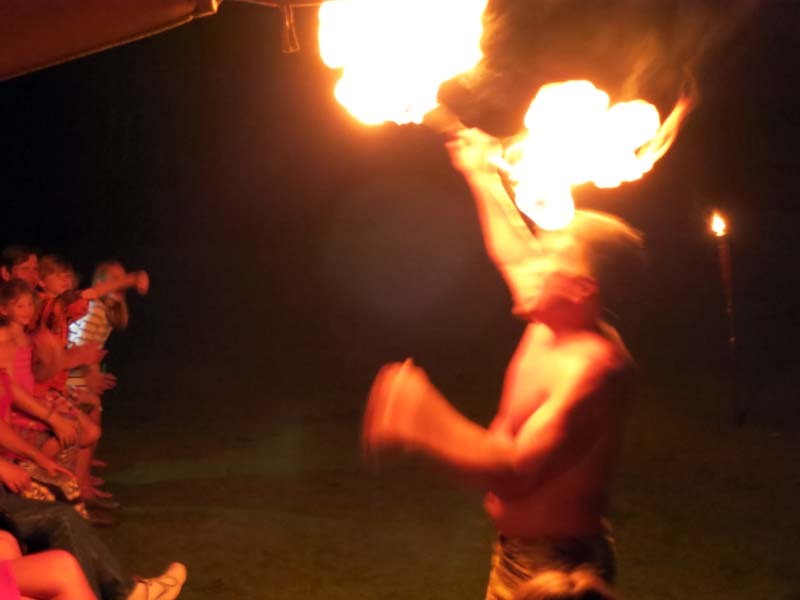 Immediately after the sun went down, Coppin Colburn changed clothes, put down the guitar, pulled out some torches out and started spinning fire! It was really fun, he's amazing. 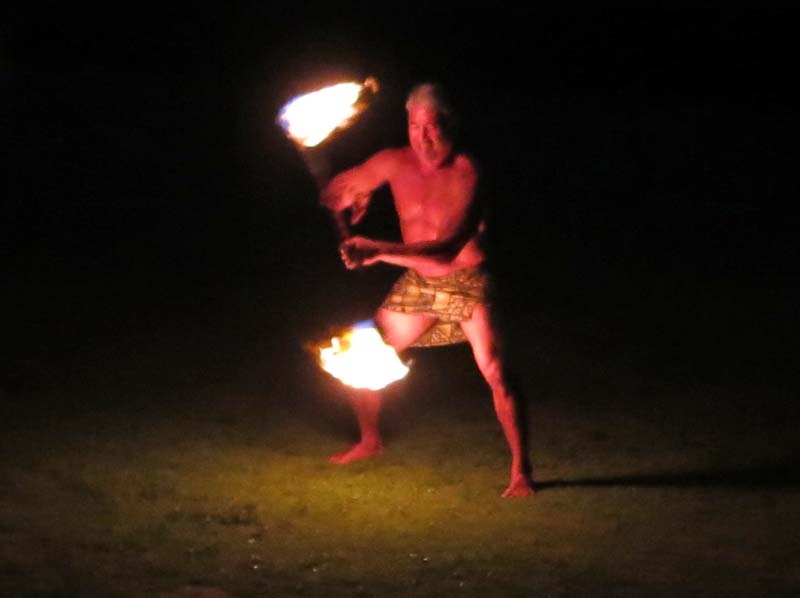 Below is a fire spinner by the name of Coppin Colburn, eating fire on the beach in Kauai. Click here for an original (huge) movie file in the QuickTime Format (probably cannot be played on Windows). 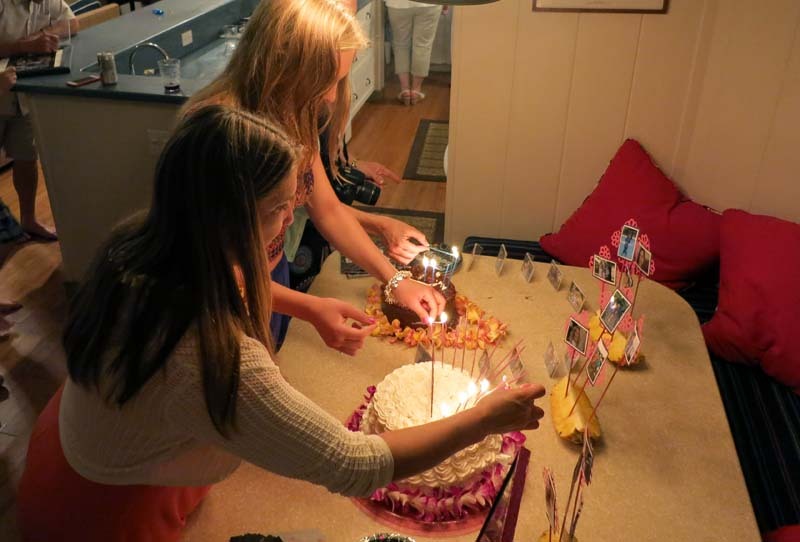 Lia and Kendall lighting the birthday cakes. One cake for Kendall, one for Art. Kendall and Art are both having birthday celebrations today. Kendall is 16 years old, Art is 74 (?). 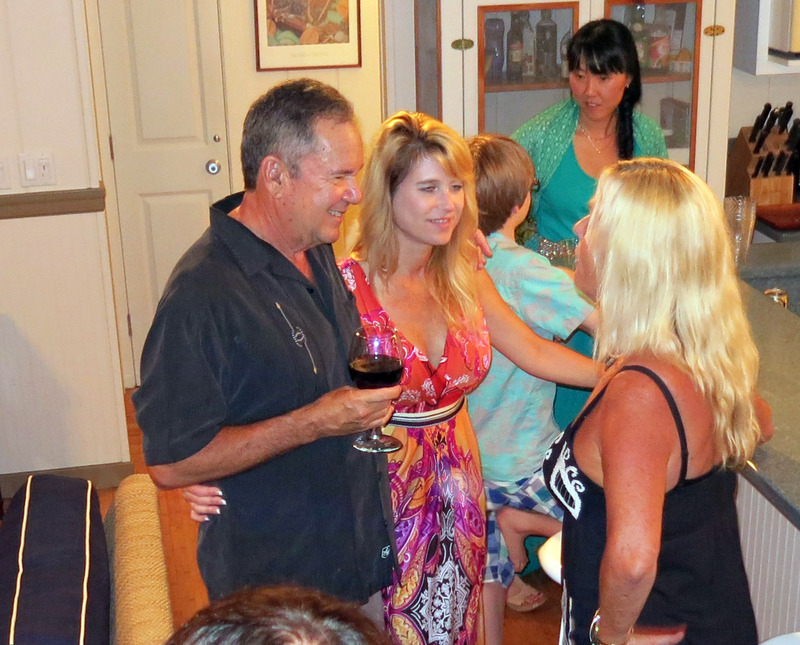 Bob on the left and wife Monika Mordasini, talking to Susan. 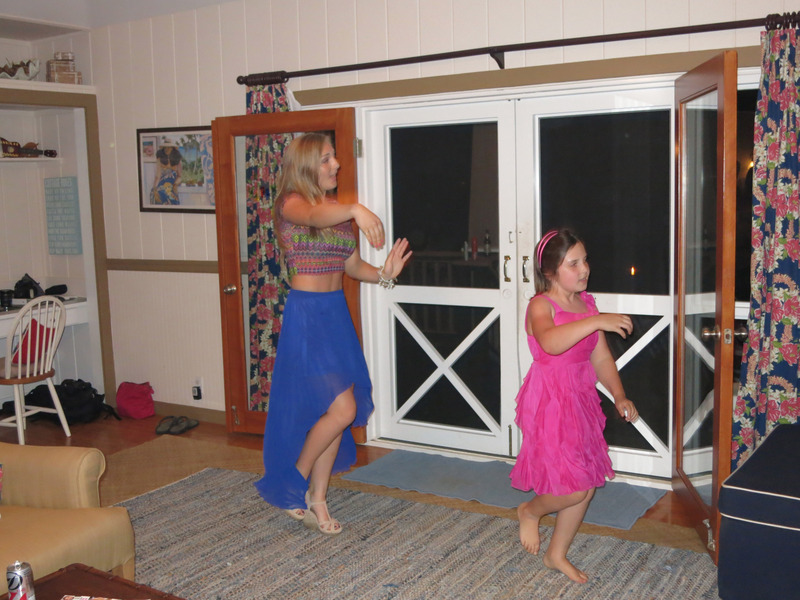 Kendall and her sister Fiona dancing to the song "Happy" by Pharrell Williams. The song was featured in the movie "Despicable Me 2". Opening presents, here is Art opening his presents. Art got an "Aloha" plaque. Kendall and Vicky take a break from all the activity under the ceiling fan. There is no air conditioning in this house at all, but the bedrooms have ceiling fans. 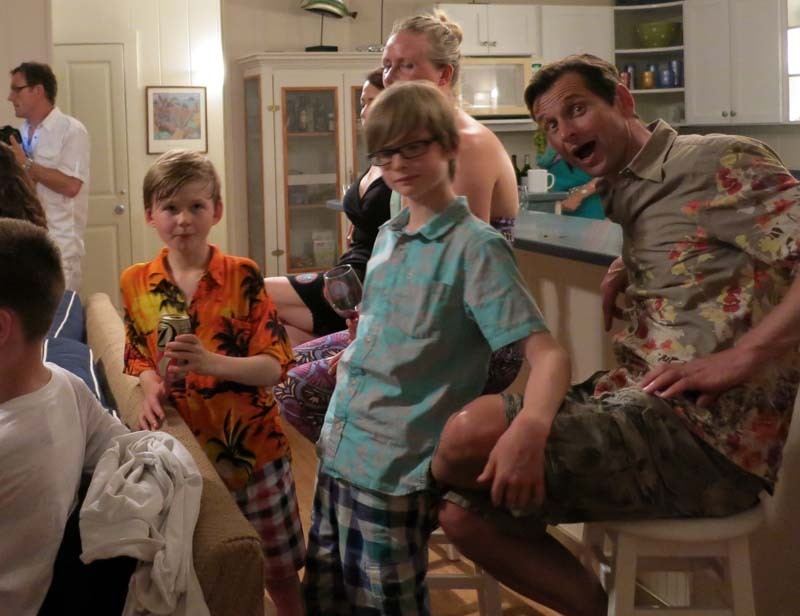 The Greenshields family: from left to right is Luca (orange shirt with palm trees), Bryn wearing glasses, Nicky (blonde hair in back), and Bob (mugging for the camera on the far right). Missing is the smallest girl Ione. 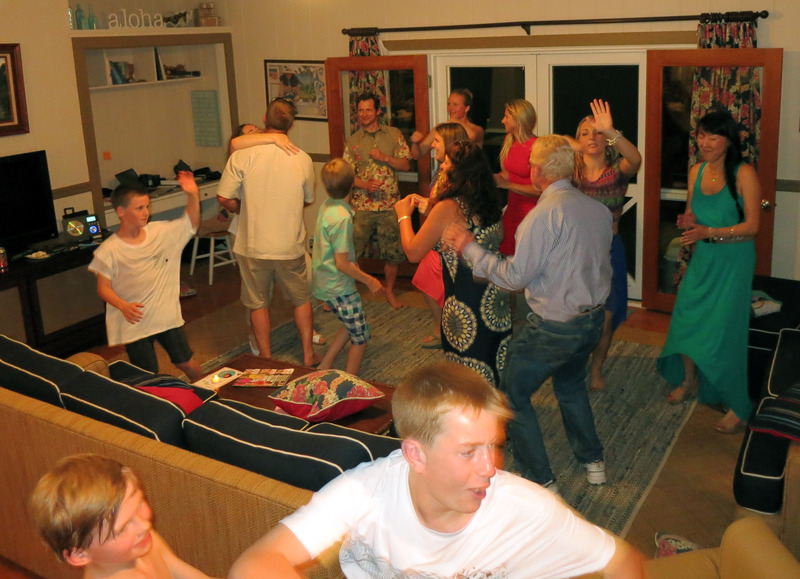 A lot of dancing occurred. 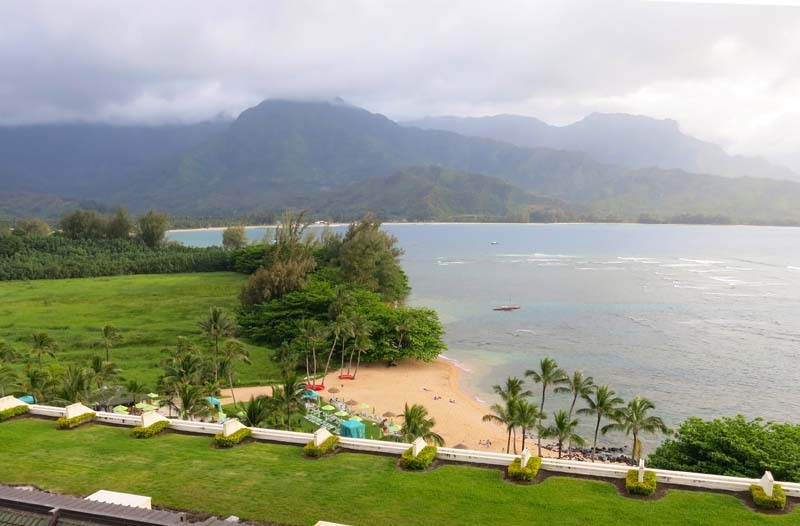 The next morning, we pop out of bed ready for another day in Kauai. This is the view from our Window. Some surfers are already out in Hanalei Bay, some are stand up paddle boarding. 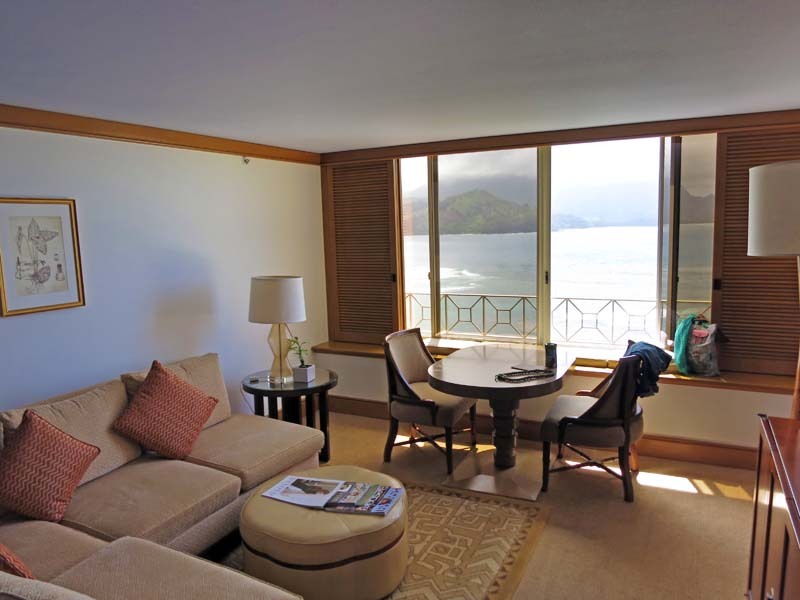 Now is a good time to take some pictures of our hotel room at the St Regis, below is a panorama showing the entire room. This is the sitting area which looks out over Hanalei Bay. A view out our window. The shower is interesting. 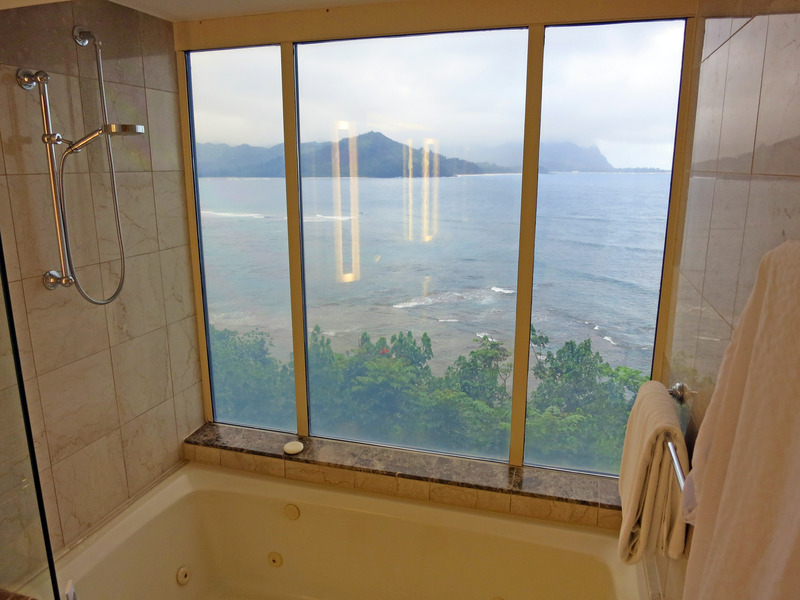 It has a glass wall that looks out over Hanalei Bay. But the glass is special. 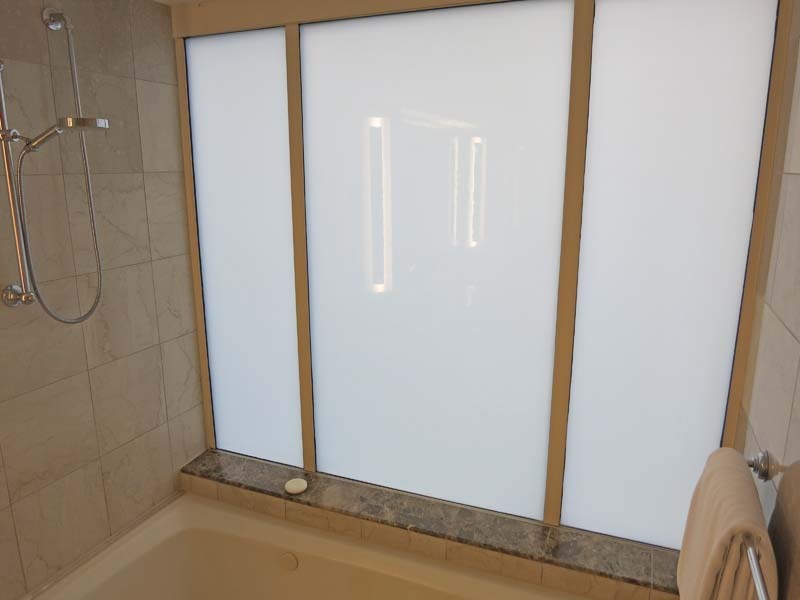 The glass is called "Privacy Glass" or "Smart Glass" or "Switchable Glass" where you flip a light switch on the wall and it turns opaque (private). 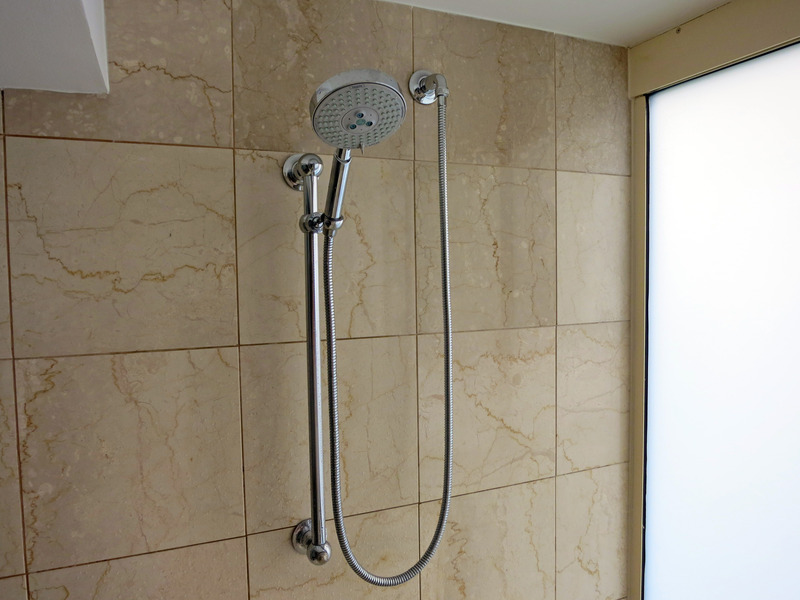 The St Regis rooms have this in all their bathrooms facing the outside. 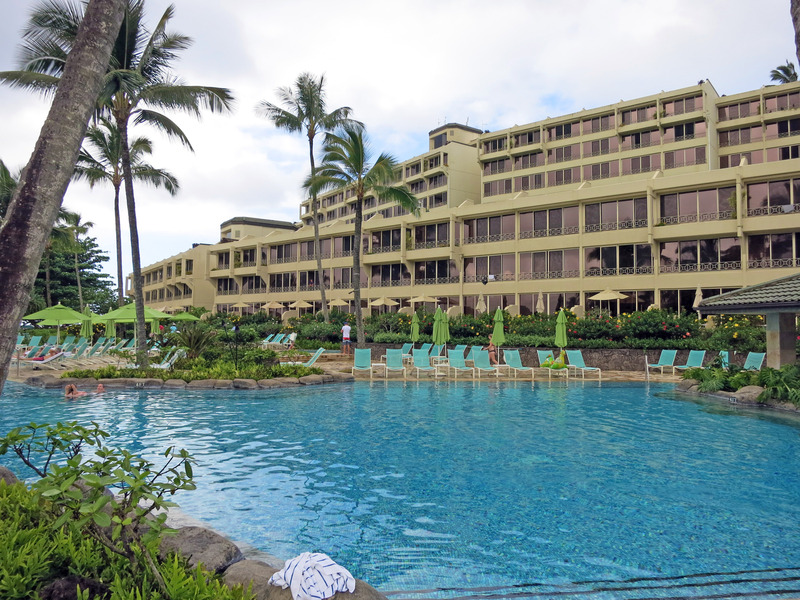 This is the pool area of the St Regis. 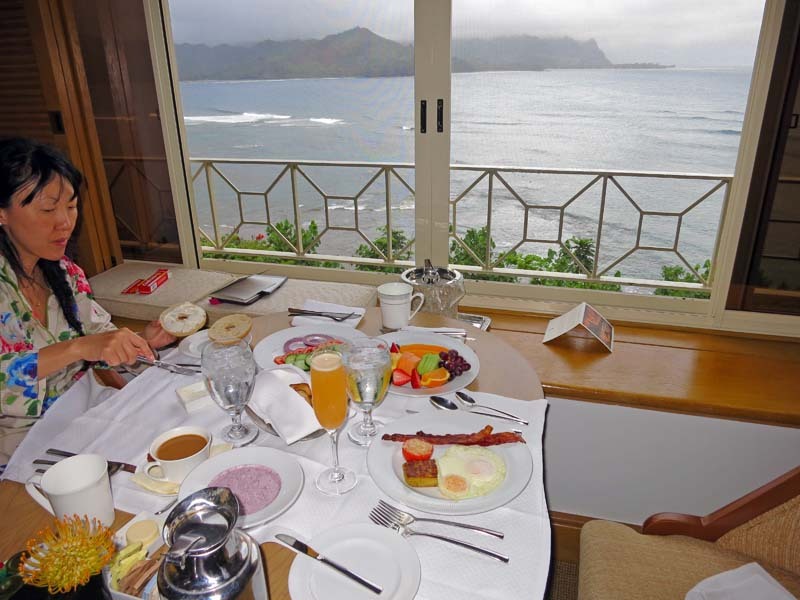 Back to our morning, we ordered room service breakfast for a nice quiet breakfast with a nice view. 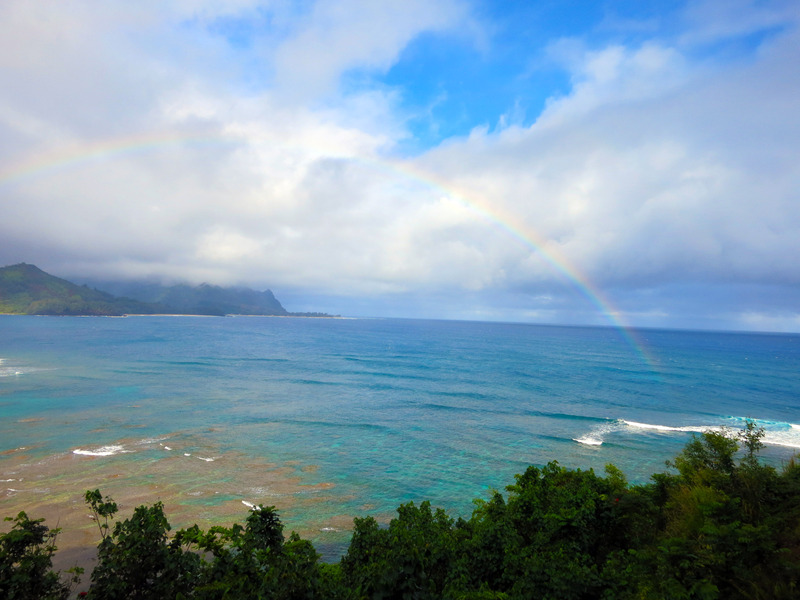 A rainbow over Hanalei Bay lit up in the morning for us. A larger panorama of the same rainbow. 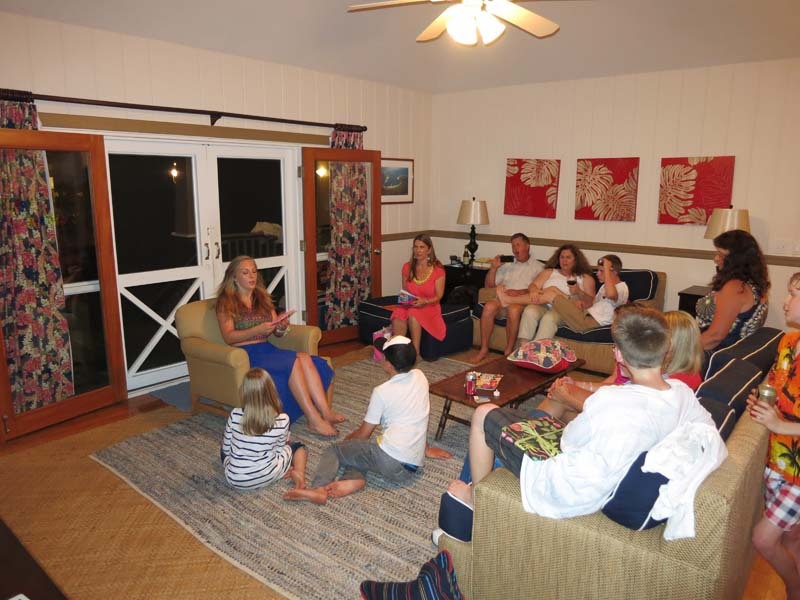 After I tried Stand Up Paddle Boarding (SUP) from the recreation area of the St Regis, we stopped by the supermarket for snacks and then back to Will and Lia's house. 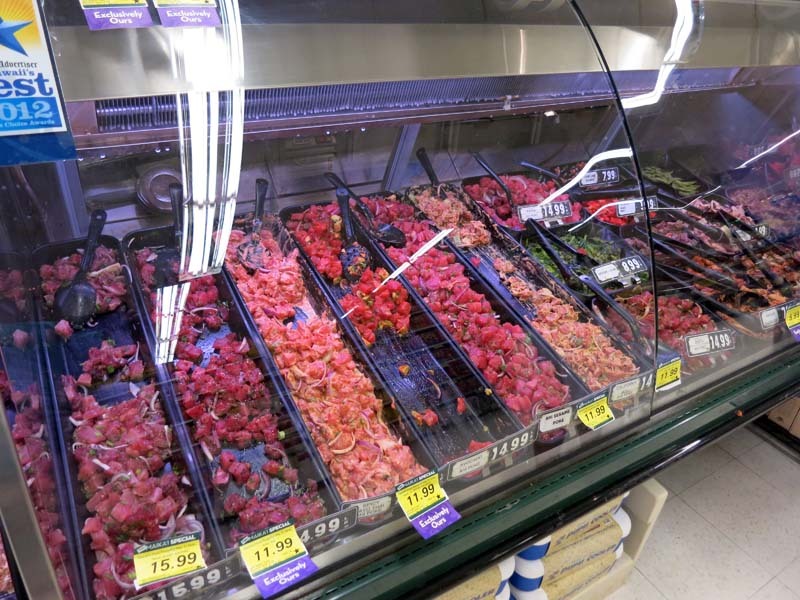 Below is a huge display of Poke (raw fish salad - much like Ceviche or a little more distant from Sushi) for sale by the pound in the super market. It is really quite good. 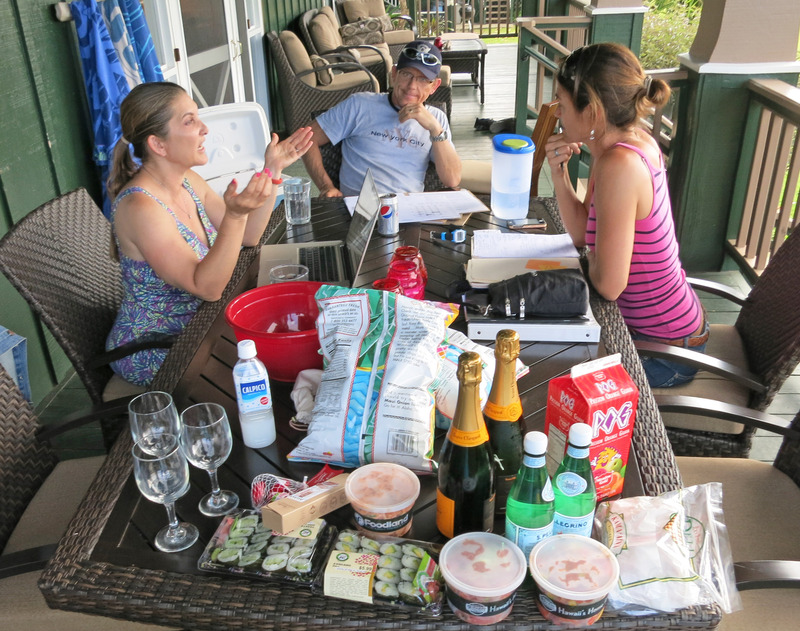 We took snacks over to Will and Lia's house, they were giving final instructions on their new Hawaii house they bought the day before. 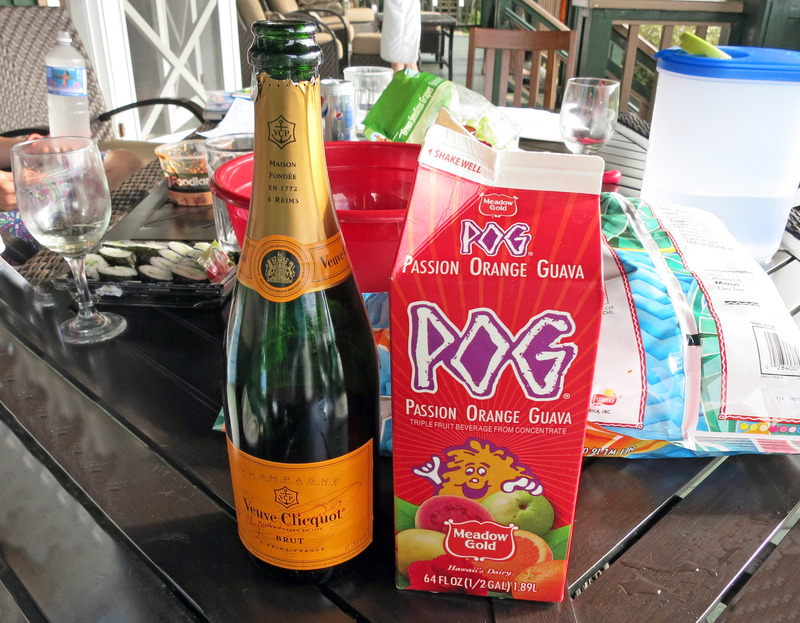 We brought Pog Memosas over to Will and Lia's for afternoon snacks! 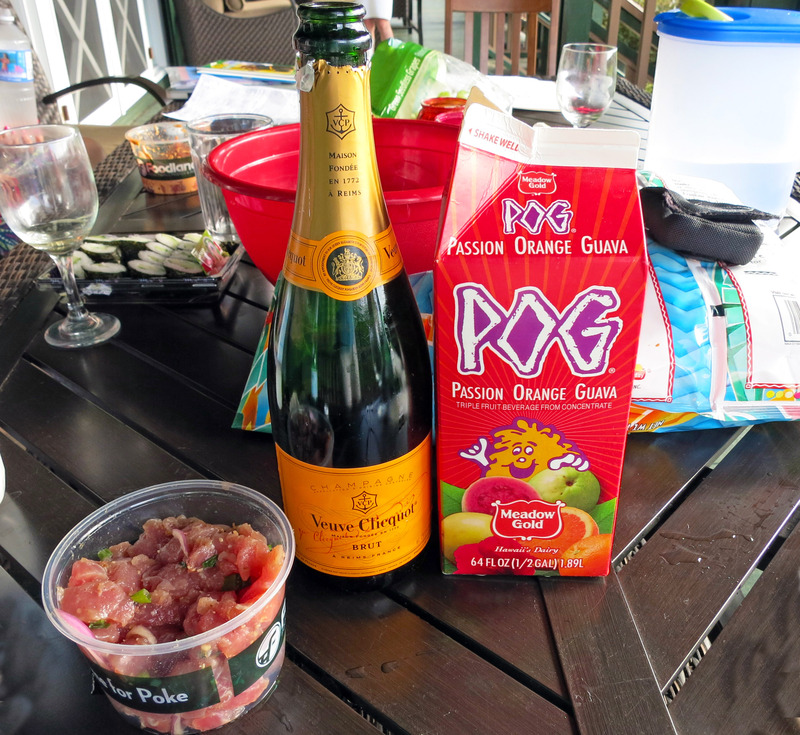 "POG" is hard to find in the mainland USA, but it is delicious and easy to find in Hawaii. Even better, POG Memosas and Poke! 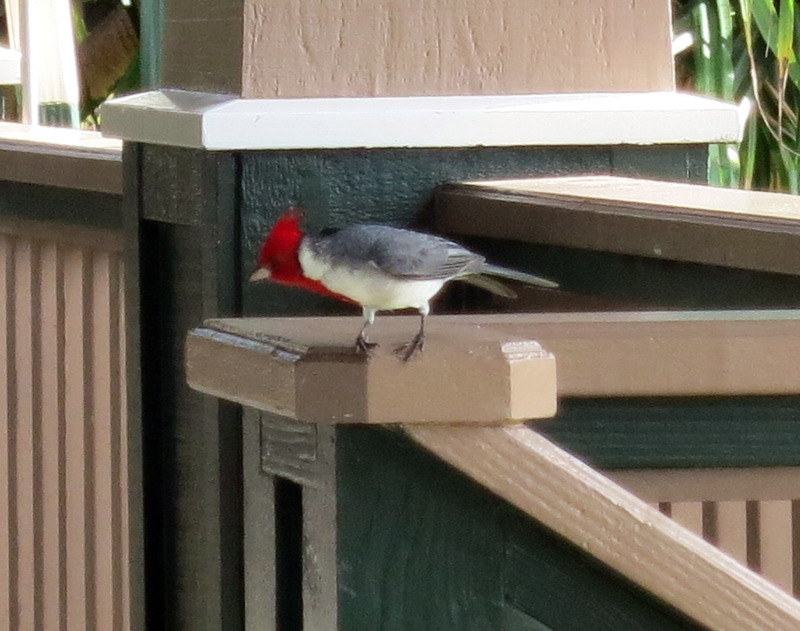 This Cardinal (a bird) landed on the deck. 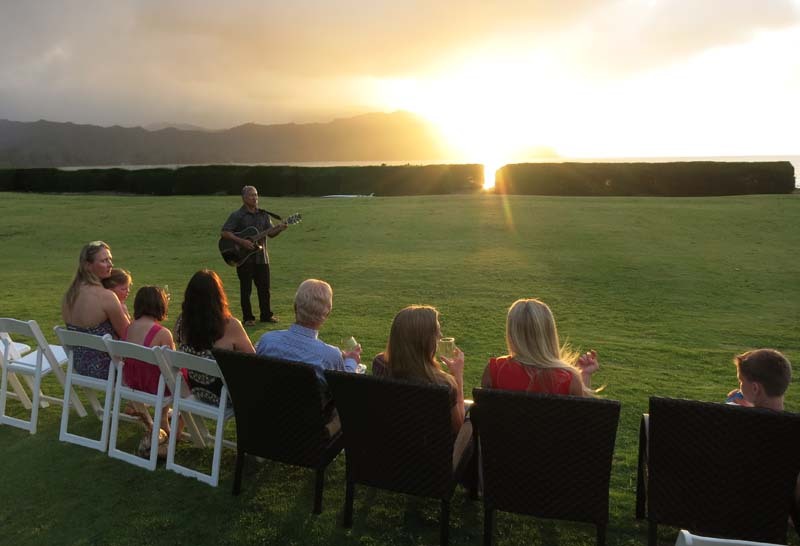 The birds are very spectacular in Kauai. 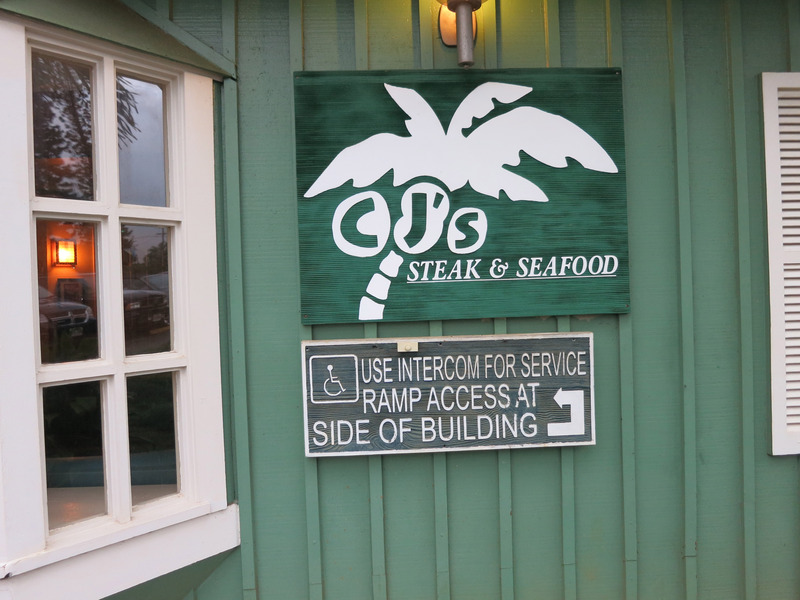 Time for dinner, we went to CJ's Steak and Seafood. The next morning everybody else left, and Katherine and I went out to find adventure. 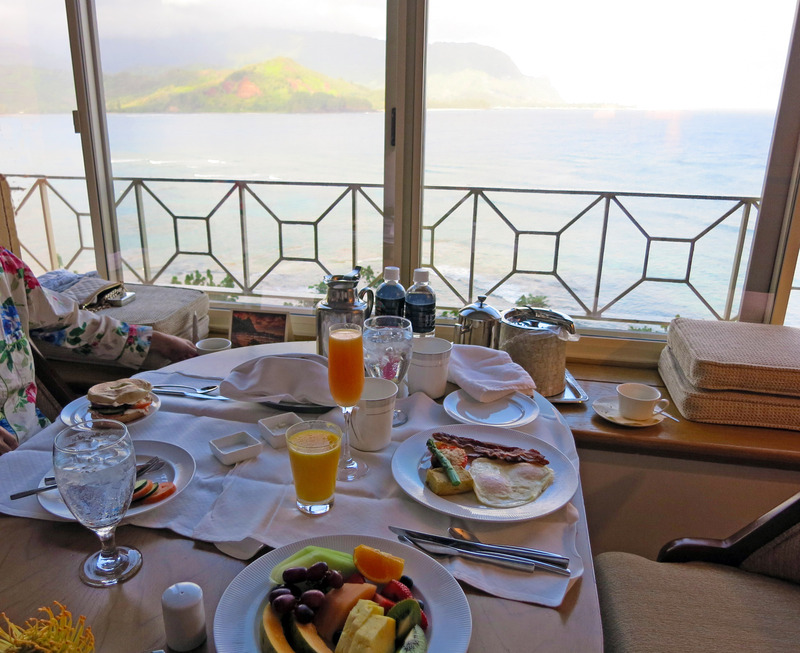 Starting with another breakfast in our room overlooking Hanalei Bay. 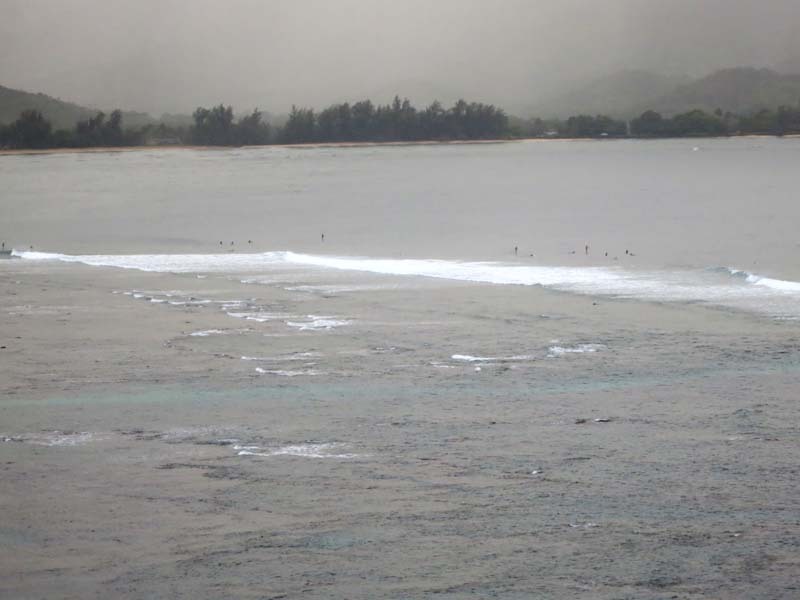 A picture looking down at the St Regis Beach recreation area. The pier and the river are JUST around the green corner from the beach. 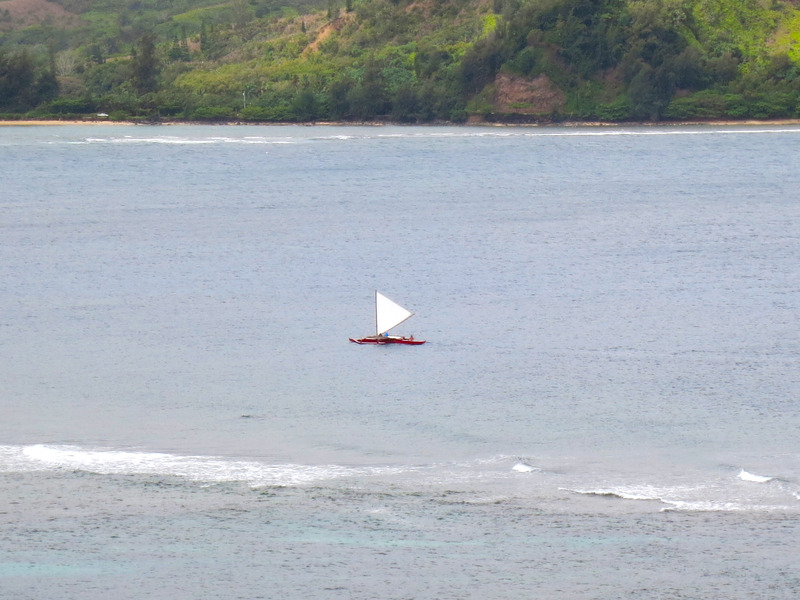 A sailboat in Hanalei Bay (see the next following photo for a close up). 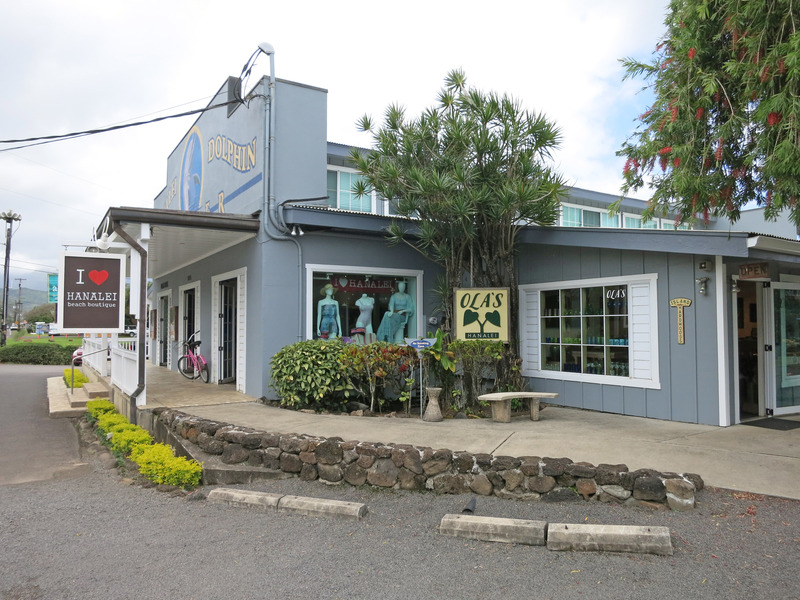 We went off to buy a glass wave and glass gecko as a souvenir. 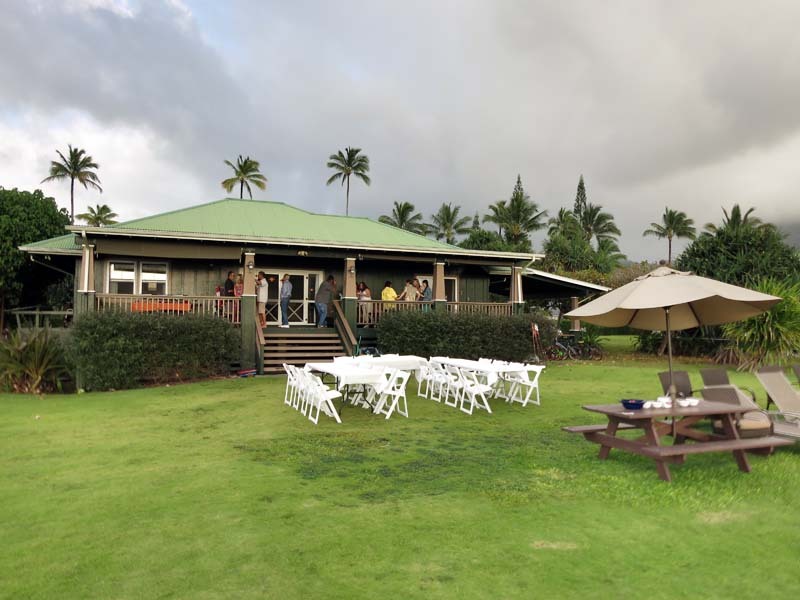 The art gallery is Na Pali Art Gallery & Coffee House. 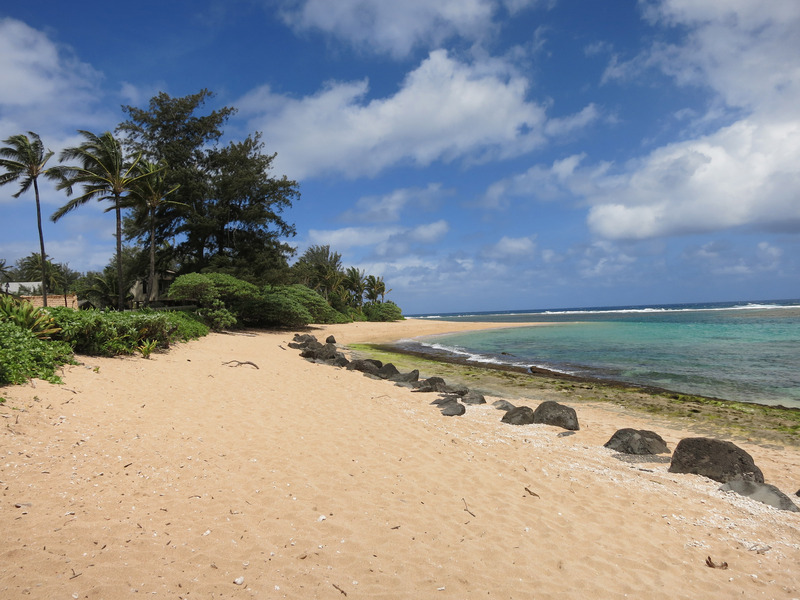 It is right by this pretty beach. On the way to the beach it says "No Lifeguard very strong current swim at own risk" in Kauai. 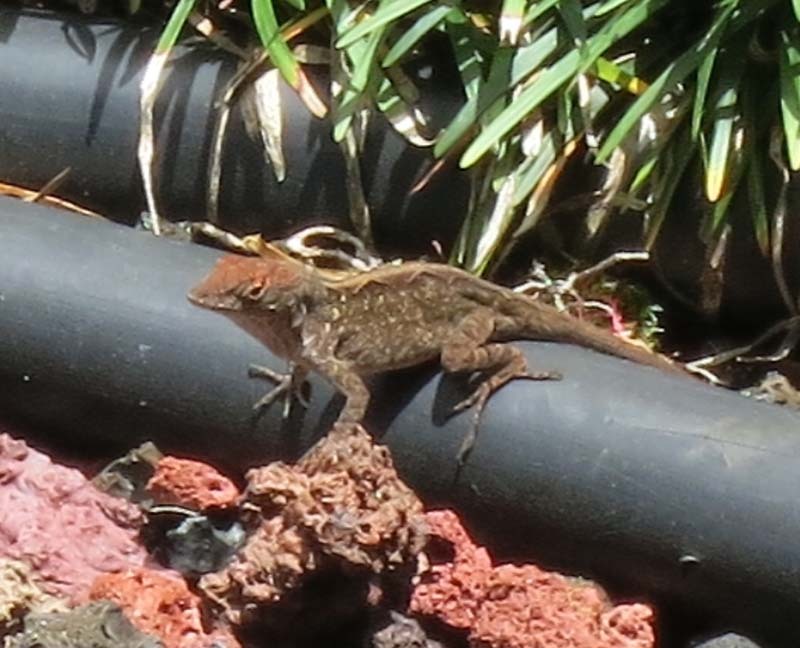 A real live lizard thingy. 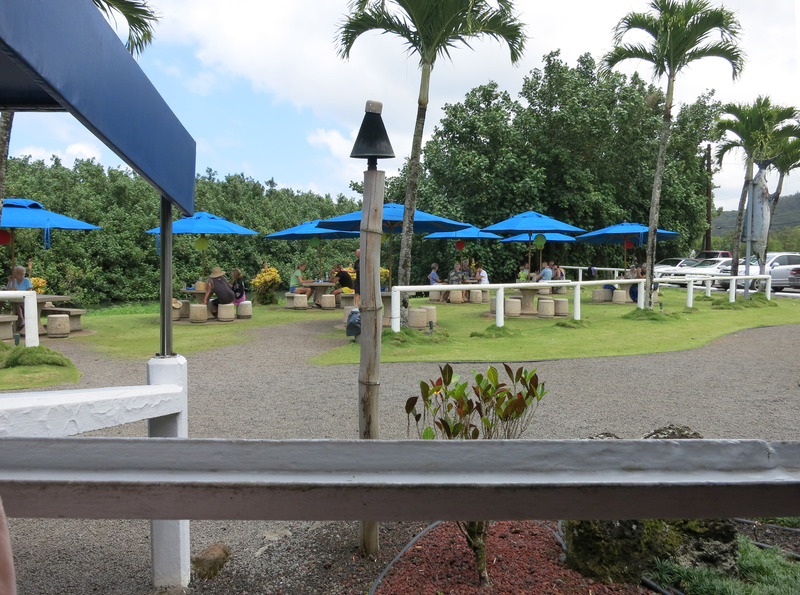 We stopped for lunch at "The Dolphin" restaurant. 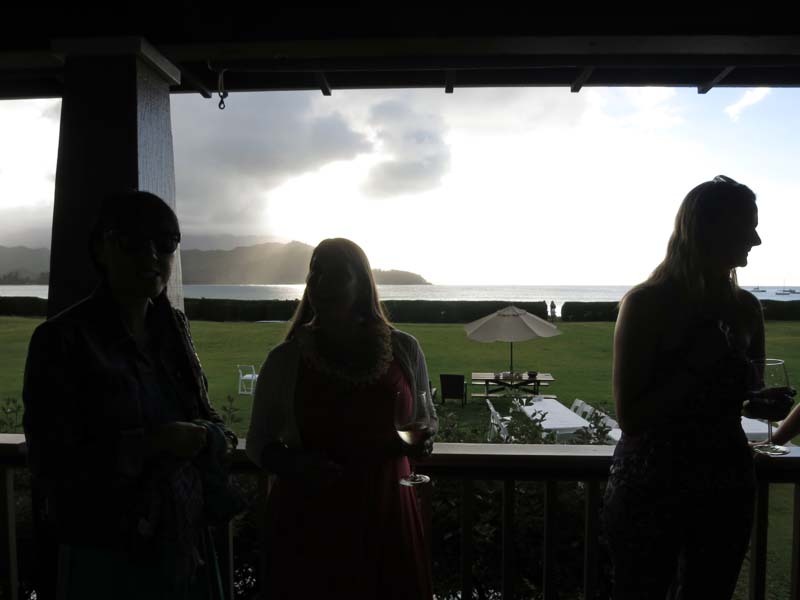 After our brush with celebrities, we went back to the St Regis, took a nap, then got up for sunset at the St Regis deck. It's very pretty. Below is a selfie taken with a timer of myself and Katherine. The camera is on the table so it kind of points up at us. The waiter did a much better job of taking our picture. 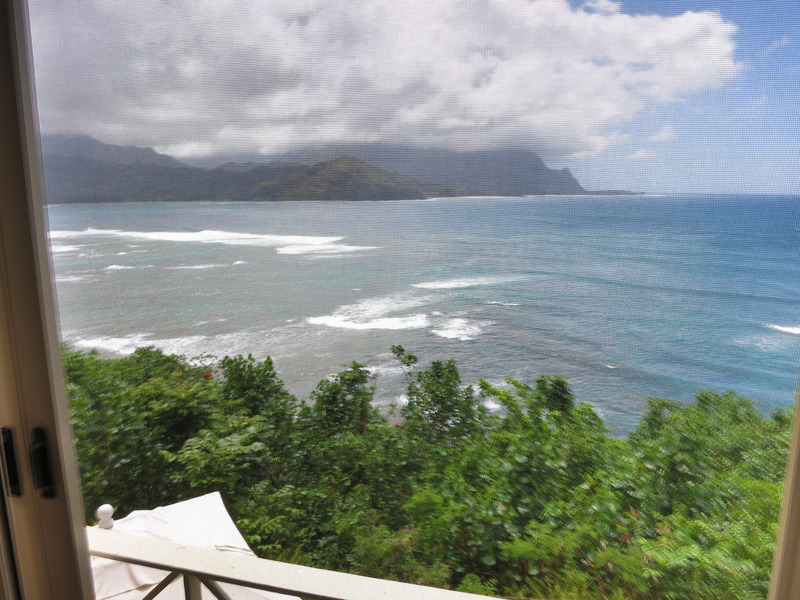 On the deck at St Regis in Kauai. Teddy and Lisa Larkin (in black dress below) came by to say hello. 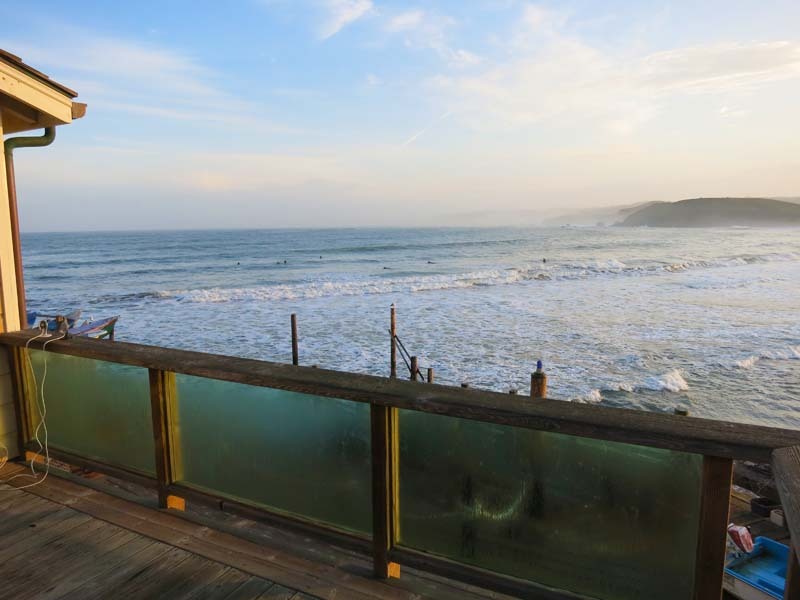 Teddy grew up in Pacifica and lived for a while in a room in the house where we live in Pacifica. 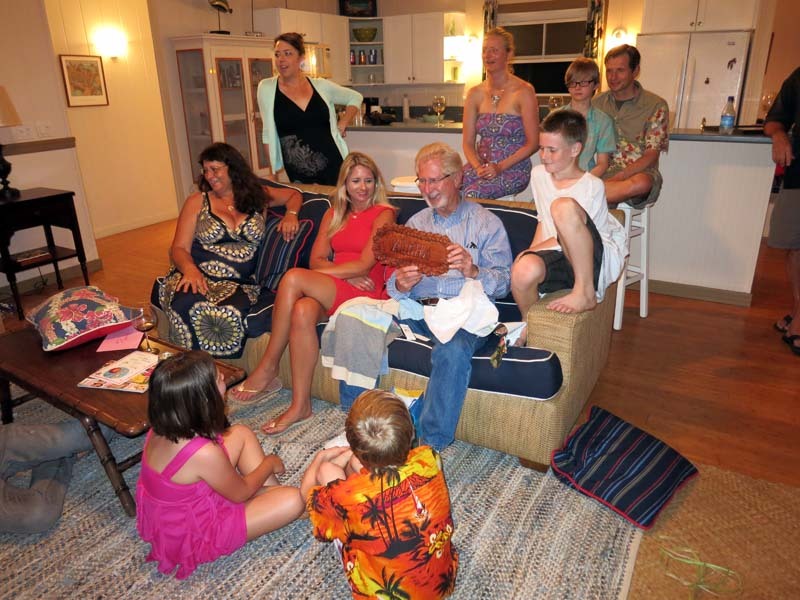 Now Teddy lives in Kauai. Teddy recently got his real estate license and can now sell homes in Kauai. 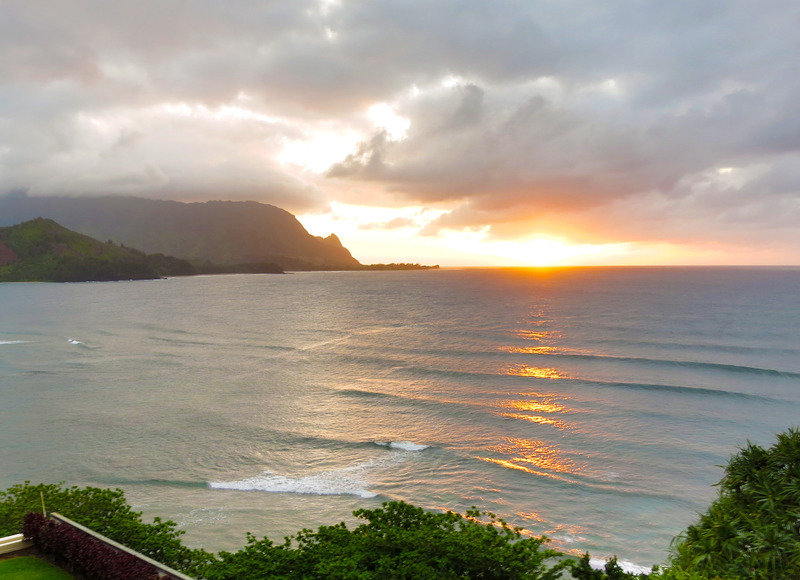 Sunset over Hanalei Bay at the St Regis in Kauai, Hawaii. 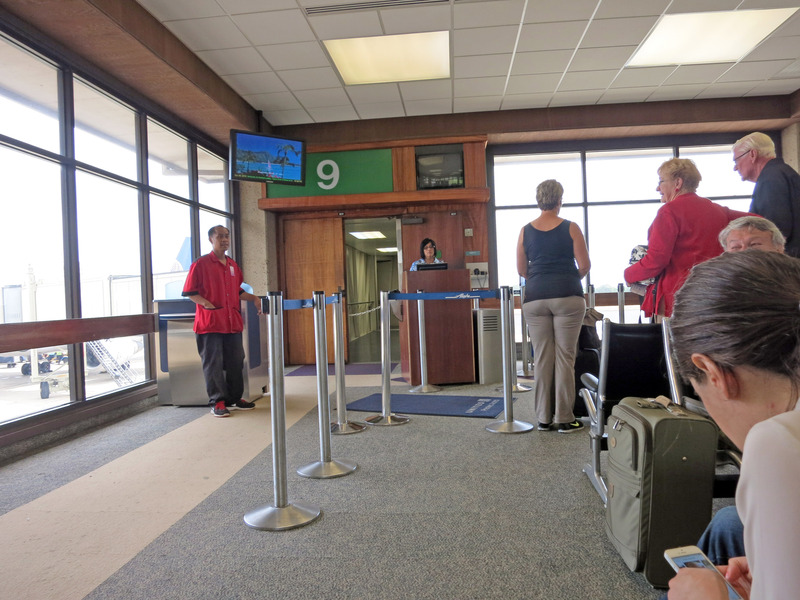 The next day it's time to go home, here in the Kauai Lihue airport (LIH), so sad! 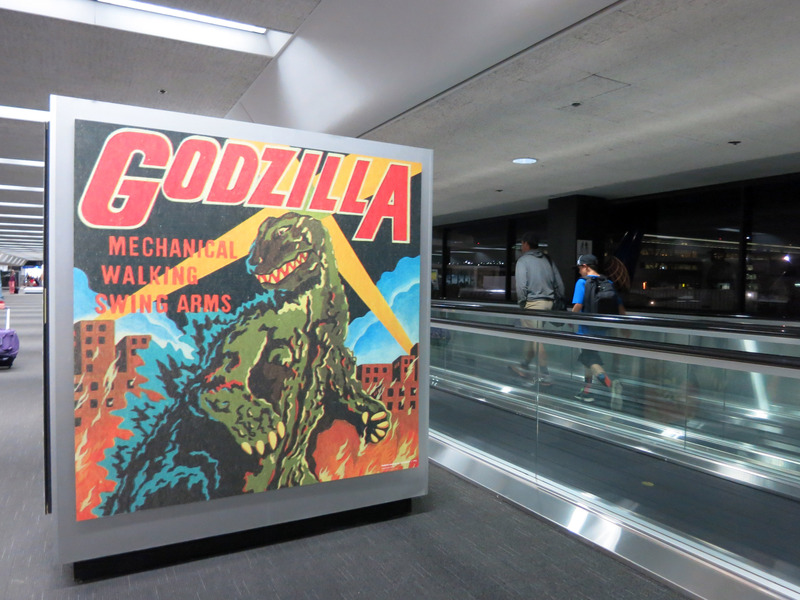 GODZILLA - Mechanical Walking Swing Arms - why? 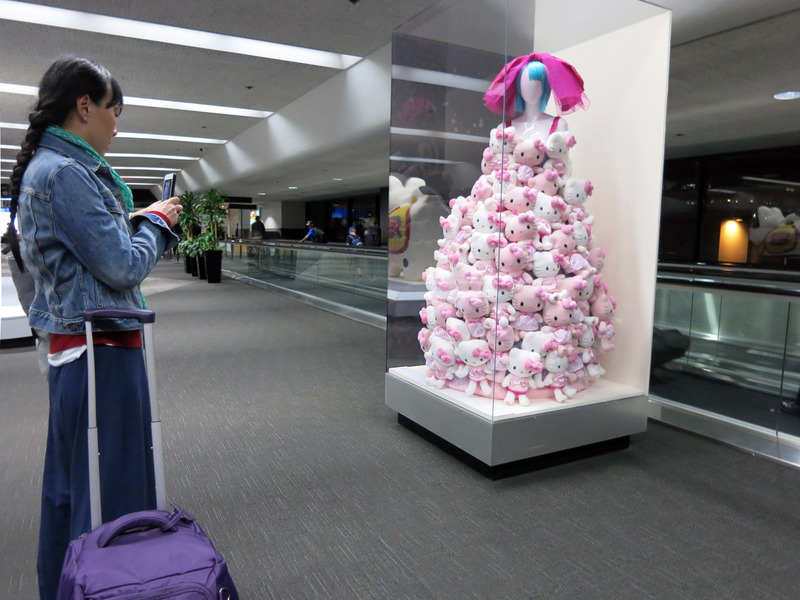 Why would you display this in an airport? This is taken from our home the very next morning on the way to work. Monday, April 21st, 2014. 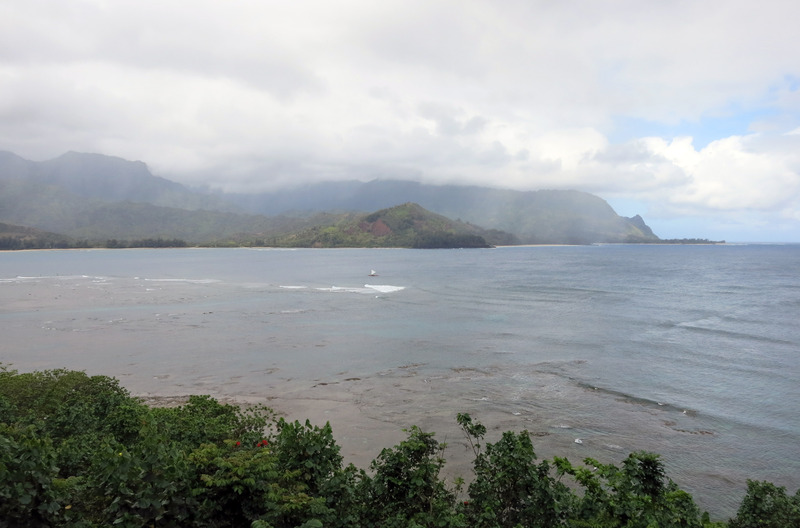 You might think it looks like Hawaii but the water and air is so much colder!